Built from years of experience, HP’s approach to storage transformation follows a model that leverages a range of consolidation and virtualization solutions and delivery models to improve upon distributed storage limitations. Think beyond a unified SAN storage, server and storage tiering to compatible block storage environments-where a single management interface for both block and scale-out file environments helps you not only successfully implement storage for virtualized environments but also ready your business for private and even public storage clouds. 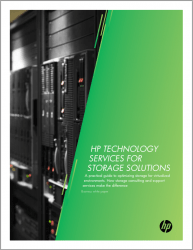 Read this white paper sponsored by HP + Intel to learn how you can extend the predictable service continuity and quality of HP Converged Infrastructure to your applications and data.